Ah, Squiders. I may be doing something very stupid, but I’m going to do it anyway and see how it turns out. You guys know I’ve been working on a rewrite for a while now. Well, I worked on getting ready for the rewrite for several months, and then at the beginning of the year, I started the rewrite itself. And you guys know it’s not been going well. In fact, it’s going so poorly, I haven’t touched it in over two weeks. Aside from this blog, I haven’t done any writing in two weeks. (Well, I wrote a synopsis, but that doesn’t really count.) And that’s a waste and it’s driving me mad. So I’m going to take a week or two off and work on something else, and then come back to it and see if I can’t figure out how to make it go better. I pondered what to work on for a bit. A short story or two would seem to be the logical choice, but I’m a little burnt out on that front. It feels like, for every short story I sell, I have five floating around in limbo. Do I really need any more floating around right now? Things related to the rewrite would be another logical choice. Maybe by working on related shorts, or drabbles, or something along those lines, I could shake loose whatever’s blocking me from getting work on the rewrite done. And I’m not against doing that, if something comes to me, but the thought of potentially hitting my head against more brick walls isn’t terribly appealing. So, you may be asking, what did you decide, Kit? I decided to start another novel. One completely unrelated, completely different in tone, etc., etc. I’ve been joking about writing this for about eight years now, so maybe it’s time to finally get on it. I always thought it would be a novella, maybe 30K, though my outlining is implying that that’s wishful thinking. It’s the same universe as Shards, with some overlapping characters. It includes a frame story, which I’ve always wanted to try my hand at. I’m going to skip Thursday, Squiders, so I will see y’all back here next Tuesday. I hope your Feb/March cusp goes well! So, Squiders, this is our final post about submitting and publishing for the nonfiction book. I’ll take a few weeks off of the nonfic books after this, and then we can talk about whether or not we’d like to do another one or not. So, today, we’re going to talk about how not to get scammed. There are a lot of prospective authors out there, and, unfortunately, there are also plenty of people willing to take money to prey on people’s dreams. While the rise of the Internet has helped authors immensely (usually a Google search can be enough to avoid some of the worst), there’s still some points to be salient about to keep yourself safe. If you’re pursuing traditional publishing, this is essential to remember. If a publisher or an agent asks for money up front, this is a big red flag. There is no such thing as a “reading fee” or a “printing fee.” In traditional publishing, nobody gets paid until a book is published. Then the publisher takes their cut, the agent takes their cut, and the author gets their royalties. Authors will occasionally get emails from various companies promising to publish them, but these are almost always scam companies. Legitimate publishers don’t have time to pull every author email they can find. Additionally, some agents may have connections with vanity publishers or editing services that can constitute a conflict of interest. If you’re looking at an agent or a publishing house and something looks fishy, ask other authors. Many writing communities have spaces where authors can ask if people have used a person or a company and what their impressions were. There are also sites that keep track of potential scams, such as Writer Beware. Self-publishing requires the author to be in charge of a lot of different aspects of publishing, and it can be a good idea to hire a professional for different aspects to help put out a quality product. But there are a million and a half companies out there that offer services to self-published authors, and it can sometimes be hard to tell legitimate companies from scammers or people who just simply don’t know what they’re doing. The best way to make sure you’re working with someone with the necessary professional know-how is to ask other authors for referrals. Happy authors are more than willing to share the contact information for someone who’s done right by them, especially since many cover artists/editors/proofreaders are also one-person businesses and they like to see them succeed. You don’t need to talk to other authors directly if you don’t know many; many authors will talk about services they used on their blogs or list them in their books or on their website. Writing communities are also a good place to ask for recommendations. Once you have some referrals, check out those people/services in depth. For cover artists, look at other covers they’ve done and see if you think their style will work for your book. For editors or proofreaders, you can ask for a sample page (or three) and see if you like their editorial style and if you think they’ll be good to work with. If you’re looking at hiring someone for a blog tour or another marketing campaign, you can normally look at campaigns they’re actively running and see how they’re going. Make sure you’re informed and know your costs/budget up front. Self-publishing is also pretty easy to DIY these days. You’ll find services that will take over the “technical” aspects of publishing for you, such as uploading your book on to Amazon, but these are unnecessary, as it is pretty straightforward to do this yourself. A cheaper and better alternative, if you feel you can’t manage on your own, is to hire a self-publishing coach who will teach you the process so you can do it yourself in the future. Companies are willing to take money for just about any aspect of the self-publishing process. A bit of research to see if a service is needed, or if you can do it yourself, can be very helpful. It also doesn’t hurt to be generally aware of the range of price for various services. That way if someone is much higher (or lower) than average, it can be a sign of something being a bit off. This is not always true; some highly experienced service providers may charge more because you’re getting a higher quality service, while many artists and editors who are starting out may not be aware of market prices or may be starting out at lower prices to build their client base/portfolio. Again, this is where talking to other authors can be beneficial. It can be hard to pick out scam contests from legitimate ones, since many contests do charge some sort of entrance fee (which at least partially goes to paying out the prizes for said contest). Again, doing your research is key here. Ask other writers, make sure the organizations running the contest are legitimate and not tied to previous controversies, make sure there’s no strings attached to “winning” (a common scam is to make buying a certain number of copies of the “winners’ anthology” a requirement of publishing, and then charging $50 a book), see if they list previous years’ winners on their website, etc. Avoiding scams across the board involves doing your research, reaching out to other authors, and paying attention to potential warning signs. Missing anything, Squiders? Anything confusing? Self-publishing can be a lot of work–not only do you have to write the book, but you have to be in charge of editing, proofreading, securing a cover, distribution, and marketing. So it can be depressing if sales are slow or non-existent. What are some things you can do to try and help boost your sales? The first step is to make sure you’re putting out a story that is in good shape, not one that’s riddled with typoes, stray punctuation, obvious plot holes, bad formatting, or anything else that makes your book look low quality or amateur. If you find yourself consistently getting bad reviews, or if reviews are consistently pointing out the same issue, it may be worth it to take your story off of being on sale and do another round of beta reading or editing. Some distributors will let people who have bought your book know when you put out a new version. It can be hard to know where to put your story when there’s fifteen million different categories available. It doesn’t hurt to look at books that are similar to yours and see what categories they’re listed in, and whether or not they’re performing well in those categories. With online distribution, it’s easy to test out different, related categories to see which ones work the best for your story. You can also tweak your keywords to see if that helps you gain traction. Getting your book where the right readers can come across it can be a lot of the battle. NOTE: If you do marketing research, you’ll probably hear advice about putting your book into more niche markets to increase its rankings. While this can be a good strategy, make sure the categories are still appropriate to your book or you’re not going to be doing yourself–or your book–any good, and you might actually do some harm. It can be helpful–and some people would argue essential–to set up a marketing plan before you release a book. This is a place where you keep track of your different marketing techniques as well as how successful different things have proven to be. You can also keep track of reviewers and your budget, if you have one. When I make a marketing plan, I often do waves of marketing, such as indicating which activities are pre-launch, during launch, or post launch. I also keep track of activities to try if my initial efforts don’t seem to be working the way I’d like them to. If your sales aren’t what you’d like them to be, it may not hurt to follow some book marketing podcasts or blogs, or to take a webinar or two on techniques that sound interesting to you. That way you can tweak your marketing strategy and hopefully find something that works for you. Many authors consider marketing to be the hardest part of self-publishing, and it can be hard to find which strategies work best for you. Be open to trying new things if they appeal to you. And when doing research, try to stick to articles and books that aren’t older than a few years, as what works in book marketing changes relatively quickly. NOTE: If you really hate some aspect of marketing–like, for example, Twitter–don’t force yourself to do it. You’ll be miserable, it’ll be a waste of your time, and your dislike will come through to the readers you’re trying to reach. It’s better to focus your time on something you like to do. Am I missing anything here, Squiders? Anything else you’d recommend checking if your sales are low? Troubleshooting: How Many Rejections are Too Many? All right, Squiders! Let’s get into the troubleshooting portion of submission and publication, which will be the last section included here on the blog. Please let me know if this book blogging thing is working for you, and if you’d like me to continue with the other books. As a quick recap, no response means exactly what it sounds like–you send your story/query off to a publisher or agent, and never hear anything again. Emails to follow up go similarly unanswered. A form rejection is a basic rejection that agents/publishers send out when it’s a definite no. These two kinds can be very discouraging, because they give you, the author, no information. Was your query/story bad? Was it good but not a good fit? Did they like aspects of it, but they’re too busy to send feedback along with the rejection? A personal rejection means the publisher/agent took the time to go off-script from their form rejection to give you some feedback. This can be things like aspects they liked about your story along with things they didn’t, it can be a note that they liked the story but do not have room for it in their current line-up, etc. In some cases, the agent/publisher may ask you to consider them in the future for other stories. A revise and resubmit means that the agent/publisher will seriously consider picking up your story if you make some specific changes to it. This is very promising–it means you’re close–but you will have decide if you’re willing to make the changes asked for, especially since this isn’t a guarantee of representation or publication. For a short story, if you’re regularly getting personal rejections or requests to send other stories, that’s a good sign. You may just need to keep trying. For novels, if your query is regularly getting partial requests, that’s also a good sign, because it means that your query letter is working. With a novel, you can often tell where, if anywhere, the process is falling apart. If you get partial requests with a query but not with a query plus five pages, then your beginning may need tightening. If your partials are spawning fulls regularly, then your writing is probably fine, but your plotting may be off. Many agents/publishers will send feedback if they’re rejecting a full, however, so this can be helpful. If you’re routinely getting the same comments, that might be something to consider updating. But if you’re getting no responses or form rejections, you may need to consider that something might be wrong with either your querying materials or your story itself. If you haven’t had the story critiqued or beta read, you should consider doing so. Critiquers or beta readers can be invaluable for helping figure out if there’s problems with a manuscript. If it’s the querying material that’s getting you rejected, many writing forums have areas where you can get help and feedback on queries and synopses. Going to a local writers’ conference can also be helpful for that, as oftentimes these offer the opportunity to meet with agents or editors one on one. So, let’s say you’re getting fairly regularly personal rejections/partial requests, have had your manuscript looked at by someone else and have vetted your querying materials run by other people. Then, how many rejections are too many? Well, on some level, this is a personal decision. Some people are lucky enough to have a story picked up after a few tries, but others have successfully sold a story after 100+ rejections. But never wait on a story selling. Work on the next one, and if the current one doesn’t sell now, it might later when you have some publishing credits under your name. Or you might find that, as you learn as an author, you figure out an awesome way to fix the story. Tuesday we’ll talk about issues with selling, for both self and traditionally published stories. Hey Squiders, we’ll jump back into the nonfiction stuff on Thursday to answer the question “How many rejections is too many?” but for today, I’d like to share Smashwords’ 2017 predictions for the book industry with you. It’s kind of a sobering read, but I’d love to hear what you guys think and any trends you’ve noticed the past few years. As I mentioned when going over City of Hope and Ruin‘s marketing results last year, some of my go-to launch activities, such as advertising on Goodreads, no longer work as well as they used to, and I wonder if some of it comes from the number of books coming out/available these days. Mark Coker (who runs Smashwords) also mentions that KDP Select has been a terrible thing for authors, and Kindle Unlimited is only making things worse. I don’t have much of an opinion on that as of yet–I’ve always gone wide with the exception of The Short of It, and since it’s been a week, I don’t have many stats to look at. People who have used KDP Select, do you like it? Have the changes that Amazon occasionally makes hurt you? Anyway, here’s the article. It’s long, but it is an interesting read. Love to hear your thoughts! I’m in a musical! I think I’ve talked in the past about trying out for a local community theater, and this time they let everybody in. (I’m not joking–they really did cast everyone who tried out.) We’re doing Godspell, and there was an expectation that a good majority of us would be operating as a chorus, just singing in the back on bigger numbers and not doing much else. Ha. Haha. Oh no. Let’s just say I got over 5000 steps at rehearsal last night. Between the music (a harder version than the original), the choreography, learning to sign a whole song (my “solo,” as it were), and dialogue, this is taking up a lot of my time. We open in a little over a month. I’m still working on my query letter for my YA paranormal. Well, I’m on a break, because I feel like each progressive version was getting worse instead of better. So right now I’m re-reading the book again with the plan to work on the synopsis. And then we’ll go back to the query. I am working on the rewrite of Book One, but it is going really really slowly. I think I’m at ~2500 words after two weeks? The beginning felt really terrible but I read back over it and it’s not actually that bad. One of the things on my To Do list for today is to make a definite plan about when to work on it, which will probably consist of setting a specific time each day and figuring out how to distract the children during that time. My Lovecraft story for the anthology goes pretty well. I’m on the feedback stage, and then I hope to do a final revision and turn it in early next week. I even have a title more or less picked out, which is sometimes the hardest part. I continue to work on my serial, though I’m not posting it up at Wattpad quite as often anymore. It seems really hard to get visibility over there, and it’s just not something I can spend a lot of time on right now. Anyone have any tips for using Wattpad or reaching more people? I wrote a short story for publication over at Turtleduck Press. It’s in review right now, and barring rejection, it should go up on March 1st. And, of course, we’ve been working on the nonfiction book series here at the blog. How has that been feeling, Squiders? On my end, it feels nice to be getting some progress done on that front (especially because I started in January of 2015!) though it does kind of feel like it’s eaten the blog. And I am a bit worried about writing the parts that I’m not blogging, and getting everything organized, but we’ll worry about that when we come to it. How are you doing, Squiders? Anything new and/or fun on your end? The Short of It is Out! Good morning, Squiders! 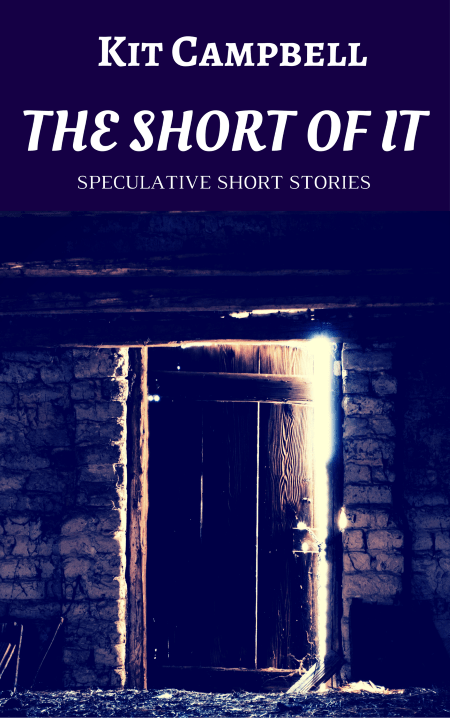 The Short of It: Speculative Short Stories is now live and available to buy on Kindle. In celebration, I’ve also got Hidden Worlds, Shards, and City of Hope and Ruin on sale for a dollar! Hidden Worlds (YA fantasy adventure) – Margery Phillips finds a magic door and then manages to screw everything up. Shards (Urban fantasy) – Eva Martinez just wants to figure out what to do with her life. Instead she gets embroiled in a millennia-old conflict. City of Hope and Ruin (High fantasy) – Theo’s City is infested with monsters, with nowhere to ruin. Briony’s home is threatened by the mutilated Scarred from the North. Their only salvation may be each other. The sale on the novels is only for today, so grab ’em while you can!